Many have said that Senator Grace Poe, only 47, the youngest among the 5 presidential bets, should have run for the vice presidency first before eyeing the country's top post. No less than President Aquino tried hard to woo her to be the running mate of the Liberal Party standard-bearer Mar Roxas. She also got offers from the opposition, as she is a also a friend of UNA standard-bearer Vice President Jojo Binay. Political analysts say it would have been a sure win, similar to Joseph Estrada's vice-presidential run in 1992 when he beat the administration bet, Lito Osmena, as well as the candidate of the then-biggest political party, Marcelo Fernan of the LDP. Proof of this is the fact that she topped the surveys for vice president prior to the filing of the COCs last October 2015, and she is the 2nd top choice for president. Although she has the support of some members of businessman Eduardo 'Danding' Cojuangco's party, the Nationalist People's Coalition (NPC), Cojuangco himself has not endorsed her nor her running mate, Senator Chiz Escudero. Cojuangco's right-hand man in San Miguel Corp. (SMC), Ramon Ang, has said publicly that it would be not wise for him to support only one candidate, and that he lends his airplane not just to Poe and Escudero. Although the Philippines' political party system is weak, with many politicians often switching parties, it's still difficult to win a presidential election as an independent. Even Cory Aquino chose to run under the UNIDO-PDP-Laban party in the 1986 snap polls. The election code also gives political parties preferential treatment on getting official results. Running as the candidates of the independent Partido Galing at Puso, the campaigns of Poe and running mate Chiz Escudero are up against political machineries well-oiled by money politics. Poe's relative inexperience in politics and public service, having served only 6 years in one small government agency, the MTRCB, and only 3 years in the legislature, is her weakest point. But being a newbie also has its advantage: Poe has none or few political baggage and comes out clean (symbolized by her white campaign shirts). Her true story of being a foundling gave her the best "emotional" connection with voters, but attacks on her patriotism and loyalty appear to have dented her popularity. Being young and relatively more idealistic are pluses for the Philippine presidency. Being a former teacher, Poe also studies hard. She also has no health issues. Among the young global leaders who have performed well are Tony Blair, who became Prime Minister at 43. Poe represents continuity but with "inclusive growth," as demanded by many. 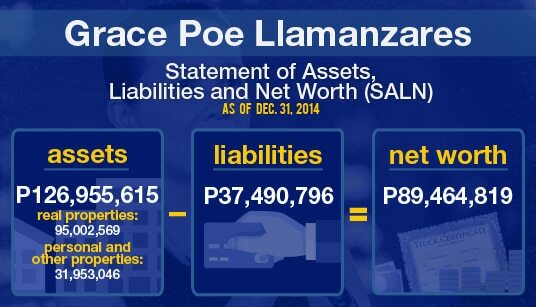 But Poe has nothing to lose in this election. She'll still be a senator until 2019, and will likely be re-elected to a second term. Another presidential run in 2022, when she would be 53, may beckon. Hers is a story made for the movies. Grace Poe was found at a church in Jaro, Iloilo in September 3, 1968. She was initially raised by nanny Sayong Militar, passed on to sugar heiress Tessie Ledesma Valencia before getting adopted by superstar parents Fernando Poe Jr. and Susan Roces. Though Grace lived a quiet life, far from the spotlight where her adoptive parents were, there were persistent rumors about her real identity. For decades, rumors claimed that Grace was the product of an affair between former President Marcos and movie star Rosemarie Sonora--an accusation their camps have vehemently denied, and sometimes laughed about. Boston College and graduated BA in Political Science, with a concentration in Government and Political Theory (1991). After graduating in 1991, Poe settled in Virginia and lived there for 13 years with husband Neil Llamanzares, her high school sweetheart whom she met when she was 16. They got married when she was 22. She has three children, Bryan (22), Hanna (17), and Nikka (12). Grace worked as a pre-school teacher for Montessori School of Cedar Lane at one point, before working as a Procurement Liaison at the U.S. Geological Survey. She was also a product manager at CSC Scientific, Inc. from 2001 to 2004. In 2004, Poe returned to the Philippines to help in her father’s presidential bid and went back to the US after the elections, in which her father allegedly lost due to massive cheating. She came back to Manila for good when her father died of a stroke seven months after the elections. Upon her return, Poe attended to her father’s estate, managed FPJ Productions, and became active in the electoral reform advocacy group Kontra Daya. In 2010, then newly elected President Benigno S. Aquino III appointed Poe to head the Movie and Television Review and Classification Board (MTRCB). 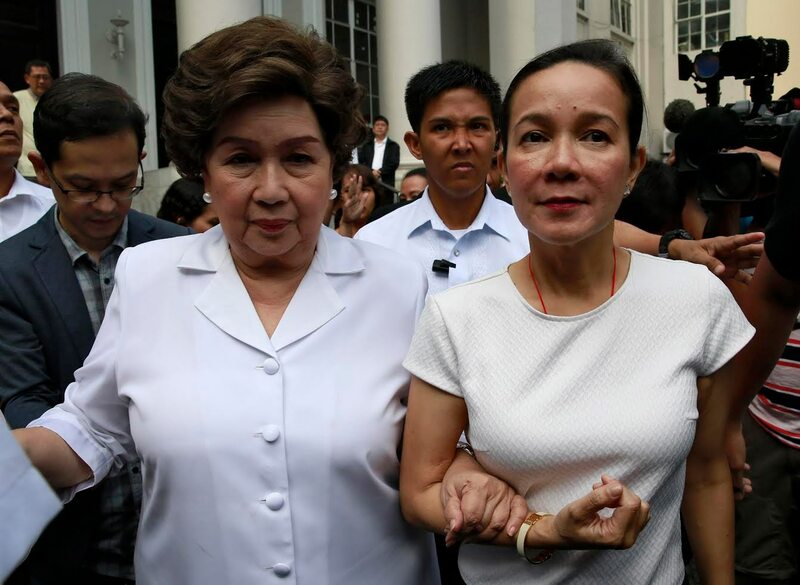 Poe headed the MTRCB for two years, or until October 2012 when she filed her candidacy for the 2013 senatorial race. On November 17, 2015, five of the nine members of the SET junked David’s disqualification and ruled that Poe is a natural-born citizen. Among those who voted in favor of the senator were Senators Loren Legarda, Pia Cayetano, Bam Aquino, Cynthia Villar, and Vicente Sotto III. Those who voted in favor of David were Supreme Court Justices Antonio Carpio, Teresita Leonardo-De Castro, and Senator Nancy Binay. David appealed the SET decision on November 23 but this was later denied because of lack of new arguments in the case. He took the case to the Supreme Court on December 8. On December 1, 2015, the Comelec 2nd Division disqualified Poe because she failed to satisfy the 10 year residency required by the Constitution. Meanwhile, on December 11, the poll body’s 1st Division voted to cancel the senator’s certificate of candidacy in favor of the petitions filed by former Sen Francisco Tatad, University of the East College of Law Dean Amado Valdez, and De La Salle University Professor Antonio Contreras. Poe appealed the rulings, but the Comelec en banc affirmed her disqualification on December 22. 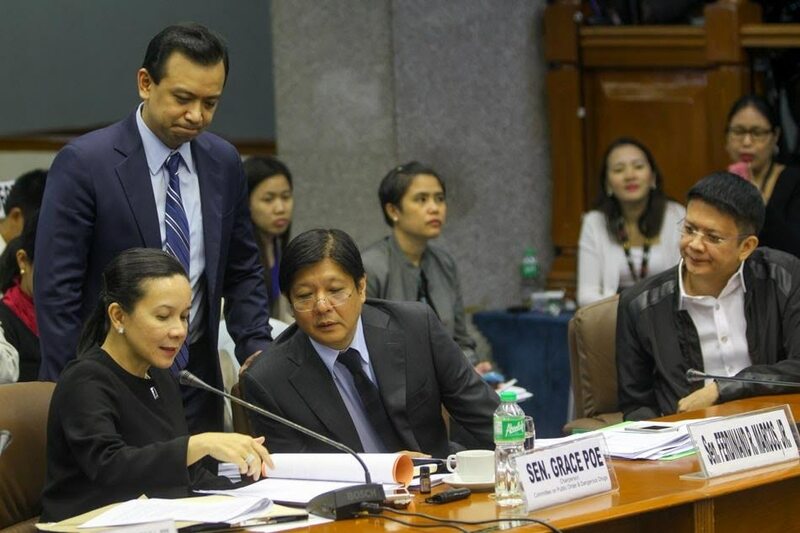 On December 28, just hours after Poe’s camp filed two separate petitions asking the Supreme Court to stop Comelec from disqualifying her in the 2016 elections, the high tribunal issued a temporary restraining order in favor of the senator. 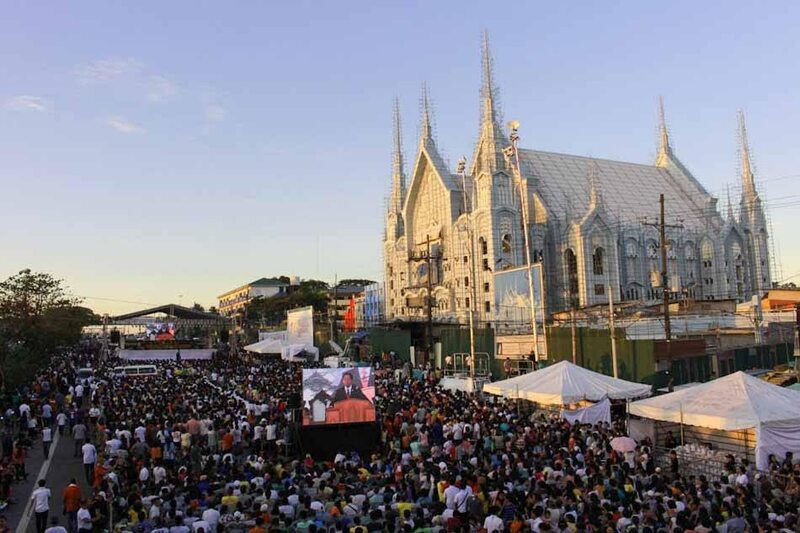 Last August, at the height of the Iglesia ni Cristo protest against Justice Secretary Leila de Lima’s supposed meddling with “internal” church affairs, Senator Grace Poe issued a statement saying that members of the INC have a right to defend their religion and beliefs, which, the government must respect. She also said the Department of Justice should focus on other important cases, such as the deaths of 44 elite cops in encounter with rebels last January, instead of the illegal detention against some INC leaders. Poe was heavily criticized for her seemingly pro-INC statement, particularly in social media, with critics branding her as just another “trapo” or traditional politician. In her first run for public office, Poe topped the 2013 elections, garnering more than 20 million votes, the largest number of votes garnered by a senatorial candidate since 2004. Before running for the Senate, Poe was Chairman of the Movie and Television Review and Classification Board (MTRCB) from 2010-2012. Poe is the chairperson of the Committee on Public Information and Mass Media in the Senate. She championed the passage of the Freedom of Information (FOI) Act, which was approved on third reading by the Senate on March 10, 2014. According to her Senate profile, Poe believes “the attainment of a just, progressive and lasting peace in the country greatly depends upon the free flow of information to the public.” The bill is currently pending at the House of Representatives. In a span of three years in the Senate, Poe filed a total of 144 resolutions and 79 bills, 10 of which were passed in to law including the Go Negosyo Act of 2013, Maritime Industry Authority, and Expanded Senior Citizens Act.